In this report, we seek to explore how the market is changing and how the challenges are evolving as time passes. We are looking to share our experience of multiple hires and ongoing searches across the WFOE market; however, we also thought it important to engage CEOs, COOs, GMs and HR personnel involved in the process to share their views directly via Q&A. We hope you find this an interesting read and we are happy to field any questions. For investors backing the China growth story, recent road-bumps such as the ongoing stock market turmoil and rising trade tensions with the US have been a sobering reality this year. However, anyone watching the race for human capital within the on-shore asset management landscape would be forgiven for thinking that market sentiment is anything but bullish. 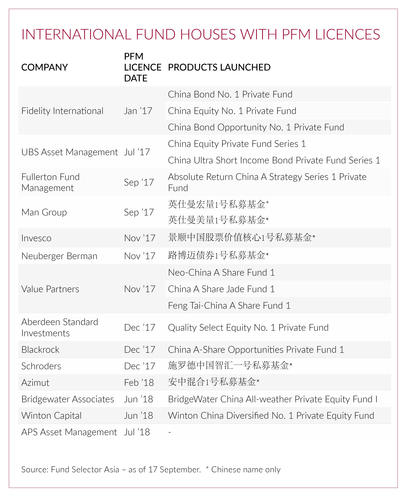 The growing crop of international fund houses looking to plant flags or deepen existing roots in China has shown a real belief in – and commitment to – this long-term and compelling opportunity. This is clear from the ever-growing list of firms setting up wholly foreign-owned enterprises (WFOEs), applying for private fund management (PFM) licences and launching products targeting onshore high net worth individuals and institutional investors. This activity has simply exacerbated the human capital pressures arising from the relative scarcity of talent that we highlighted in our Spotlight on China six months ago. The significant challenge of attracting, hiring and retaining the right individuals, across the front-office and infrastructure positions, continues to be one of the big barriers to firms being able to capitalise on the business potential onshore. We are entering what we are calling “Phase II” of the recruitment landscape. The big difference being that the first movers had to either relocate staff or search from an onshore talent pool, but there were no PFM WFOEs to hunt from; heading into 2019 this is now very different. Established WFOE need to equally focus on Talent Retention as well as Talent Acquisition; new comers will hunt in the PFM WFOE pool as a first port of call; and we are now seeing WFOE to WFOE moves. There has been added complexity to the process of setting up or staffing a WFOE, however as of now these complications do not seem to have had a material impact on the appetite of the overseas asset managers. Recent changes to the Individual Income Tax (IIT) Law for foreign passport holders working in China (although now resolved) could have had a genuine impact, but the reality is a “wait and see”; whilst the slowing down of the approval process from the regulators again appears simply to be an issue to be navigated and not one to change tact. Whilst China remains a difficult market to navigate, and it still not possible to follow a strict formula for developing the WFOE (beware “experts” with concrete advice), the landscape for human capital is maturing. Attracting the right people is difficult (but not impossible), and a local lens does need to be applied. As already mentioned, the onshore market is moving so quickly right now that we are in uncharted waters as regards to human capital challenges. Below are seven themes we have identified as being relevant and consistent in the past few months, and as we head into the end of the year. It seems simple to point out, but the reality of the evolving market means that those firms entering China in 2019 are facing different recruitment challenges and opportunities to those faced by the first movers in 2016 and 2017. The first movers had to either relocate staff or hire from JVs, Chinese Mutual Funds or Advisory/Research WFOEs; and the challenge of culture and operating in an international environment were always seen as a critical part of the hiring decision. Those looking to enter in 2019 will naturally look to hire (in part) from the existing PFM WFOEs as a logical first step, a luxury not given to the early arrivals. This means that the first movers need to focus very hard on Talent Retention over the coming 12 to 24 months; this does not mean simply competitive compensation, but good people management and following through on the strategy that attracted the team in the first place. For new WFOEs, the priority remains a general manager. Since this individual will spearhead the business, it is a decision that will impact the ability to hire within the group going forward. As a result, foreign fund houses face a dilemma: while the available talent for them to consider is shrinking in number, they know that hiring the wrong GM is probably the costliest human capital mistake they can make. In addition, there is an increasing focus on expanding the various front-office and infrastructure roles. Competition is hottest for compliance professionals, traders and portfolio managers. In terms of the latter, however, many global players are now opting to bring on board what some practitioners call “shadow PMs” – where a global fund house puts in place a less experienced individual on-the-ground, with a more senior PM offshore having oversight. Recent regulatory changes in China to loosen restrictions on foreign investors’ ownership in joint venture (JV) fund structures are the source of further competition. There is uncertainty around the outcome of existing JVs based on ongoing negotiations, bargaining power and the existence (in some cases only) of previous agreements between the foreign and Chinese parties. As a result, many senior candidates from JV mutual funds are now more active in the job market. Many foreign firms are trying to look to the potentially-larger commercial opportunities outside the PFM world and see this as a journey where the map is becoming clearer over time. Whilst Shanghai undoubtedly remains the hub for the PFM WFOEs, increas­ing business needs in Beijing especially for foreign managers are apparent. We see a shift in demand among our clients towards Beijing-based executives, which represents an evolution from the previous focus on hiring only in Shanghai. Among the drivers of these trends are: a need for replacement staff; gaps left by individuals leaving current representative offices; and new roles created as a result of recently-established advisory WFOEs in Beijing. The current market environment is also challenging international asset managers to tap the existing, relatively-shallow talent pool. Some other foreign funds setting up WFOEs are run by life insurers and even private banks. As the number of international asset managers with WFOEs grows, we are seeing a sequenced and pragmatic approach to human capital becoming more prevalent. Best practice in today’s market seems to be hiring the GM and Chief Compliance Officer first, with the top-picks being individuals who possess a combination of strong government relations, deep market knowledge, relevant contacts and an ability to interface with management in offshore offices. A second wave of hires will tend to consist of heads of legal, operations and trading. Firms then need to decide on the type and size of Investment teams they want onshore. Sales hires are now more likely to be much later in the process to avoid staff being hired who are unable to perform their duties while waiting for regulatory approval. From an investment perspective, many investment management WFOEs are looking to differentiate themselves by offering a more diversified range of products today than they did a year ago. In line with investor demand, these include, for example, quant strategies, commodity trading advisors (CTAs), multi-asset funds, real estate, private equity and fund of funds. To achieve this, these WFOEs need to either hire local talent onshore, or relocate employees from outside of China, including Hong Kong. Another option is to acquire local private funds or mutual funds. We have observed a number of overseas firms exploring the possibility of buying existing fund management companies in China. This seems to be driven by a desire to either turbo-charge an organic build, or to short-circuit the organic build altogether. The strategy seems simple in theory, but execution appears fraught with complexity. In China’s vast fund industry, the foreign presence is still small. To date, a total of 14 foreign managers have received permission to launch products that invest onshore to domestic professional investors. However, this is out of 9,000 PFM licence holders, according to recent statistics from the Asset Management Association of China (AMAC). Foreign managers have launched 16 funds aimed at domestic professional investors out of 36,000 total products available. This poses an interesting question to global firms: is it better to buy a PFM-licensed firm or a local mutual fund to leapfrog the process via the existing track record and AUM? The current WFOE landscape offers multiple opportunities for international asset management firms to access the local base of institutional and high net worth investors. 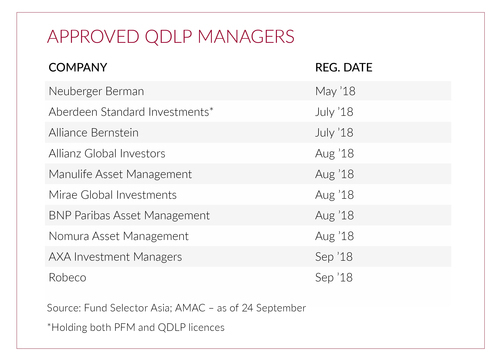 There are also firms with an unconfirmed status – a licenced QDLP and/or investment management WFOE but which have yet to register a WFOE with AMAC. As the market moves quickly and the competition for the best staff intensifies, we conducted confidential interviews with three senior industry decision-makers to gather comment directly from individuals responsible for hiring staff for their PFM WFOEs onshore. Below is the summary of this cross-section of views based on the same six questions around human capital opportunities and challenges. What do you see as the most significant barriers to hiring the right talent in China’s asset management market? CEO – Cost and candidates with sufficient and relevant experience, such as in asset management, both locally (ideally in private funds and mutual funds) and globally. GM – There are certainly challenges today, but not in comparison with those I expect to see in the future, once WFOEs move in to the direct retail distribution channel. When this happens, there will be direct competition between foreign and local players. At that point, language and investment skills will become more important and will be in even greater demand. HR – The challenges often depend on the role; for some, there could be language barriers, whereas for others there is a small talent pool, such as for PMs with three to six years’ experience who do traditional bottom-up investing. We find that we need to move much quicker in China than in some other markets, so we don’t have the luxury of trying to compare three or four candidates and bring them all through the process; we need to be decisive. In addition, educating internal managers that are new to working with Asia, and especially China, requires us to choose the right people, not just those who are the best communicators. Finally, the increasing tax for potential internal transfers is another challenge. Has the shortage of talent in some areas of the China market influenced the plans for expanding your business? CEO – Not yet, but the universe of decent candidates for certain functions is very small, for example in compliance. GM – Unless we have the right people, we won’t be able to launch funds across various asset classes. It is challenging to attract the right investment personnel as some of the best people work at local funds and are often managing funds of significant size, at least in comparison with the AUM of WFOE-run funds. What would you say are the main ‘pain points’ when hiring talent in China? CEO – Cost, along with candidates who can understand the bigger, global picture. GM – Finding people who understand China and also how to work within a global franchise. Very few, if any, candidates that we speak to are going to be perfect; we need to look more at the value they can bring. We need to approach the situation with flexibility and not get too focused on someone’s ‘day one’ value. A ‘growth and potential’ mind-set is more appropriate in determining someone’s long-term value, rather than finding ‘plug and play’ talent. HR – Dealing with regulators. This can make it difficult for people to resign from current companies, depending on their previous role and what they will do at their new firm. What specific leadership characteristics do you look for in the talent you hire for your China business? CEO – The ability to see beyond China, to accommodate a global perspective and champion the culture of a global organisation within China. GM – Cultural fit is the most important characteristic. The desire to put clients first is also essential in anyone we decide to bring on board. They need to operate in a transparent way and be able to articulate themselves. They also need to be a team player. HR – Adaptability, strong communication skills and an ability to work across functions versus just being a technical expert. As there are many challenging situations that are very complex, we need someone who can navigate the ambiguity and keep internal stakeholders informed. We don’t necessarily need someone who has done this type of role before; we prefer someone who is looking to build a business, so that they are hungry and driven. We want to hire someone who really questions our business plan and strategy before they are willing to join us, since this shows they appreciate that it will not be an easy road for a foreign firm. Are the ongoing global trade tensions having any impact on your plans for the expansion of your asset management WFOE business in China? CEO – Not yet, but recent news about a policy shift back towards another QDLP slowdown suggests that the global trade war is now having an impact on asset management. GM – Not at the moment from the standpoint of investment into the WFOE. The only risk, for a US WFOE, is multiple licensing processes being potentially delayed in some way. However, at this stage there is no evidence this is happening. How are you approaching talent retention in your China business? Do you have a specific strategy in what is a very competitive market? CEO – This is a work in progress. A critical success factor in talent retention will be finding a way to give Chinese employees ‘skin in the game’ via equity in the organisation. GM – We try as best as we can to bring in the right people under the right conditions in the first place. We have put in place a hiring process that places honesty and transparency at its core. We aim to ensure, through constant open and honest dialogue, that we know what people think about the direction things are going in. We also look to ensure there is a firm-wide understanding of how to engage with people in different geographies. We want to provide the right amount of support and resources for staff, so we continually seek to understand how comfortable the staff are with the business strategy, their personal progress and how they are evaluated. We try to create clear goals to which people are held accountable. Stability is key, as is the need to ensure that the views from both the Hong Kong and China perspectives are aligned. HR – We ensure they have accountability and the right level of autonomy. We also want their voices to be heard, to get lots of regional and senior leadership attention. We fully understand that there will be turnover, so we need to focus on building the right infrastructure to be able to sustain turnover and not cause issues in other functional areas. We thought it would be useful to provide a recap from our previous China asset management report on the common factors and recurring themes that continue to impact the decision-making for candidates and potential employers in China. Some of these factors remain unchanged from six months ago, while some have risen in significance and others have fallen. We have included drivers for foreign employers in non-PFM WFOE structures also. Forgive us for stating the obvious, but the market remains hugely busy; demand for talent is high and the qualified candidate pool is thin. However, behind the self-evident headline, we genuinely feel that the landscape in China is changing and the challenges that go with this are changing too. Foreign firms that are established now have a much better grip on the market and are being driven equally by their local leadership. New entrants, meanwhile, have a different talent landscape to look at, including those that have already trodden the WFOE path. 2019 promises to be a busy and eventful year. Our observation and opinion is that we are entering “Phase II” in the evolution of the WFOE story from a human capital perspective. Both employers and potential employees understand the market better, and whilst high demand persists the slightly frenzied atmosphere of early 2018 has passed. The demand for talent in the roles of GM, Compliance, PM and Sales remains high, and fundamentally the decision-making criteria for both parties has not changed. Many foreign firms are thinking two steps ahead to majority JV control or gaining local Mutual Fund Licenses. The importance of sequencing hires and establishing goals for the next 24 months is thus paramount. Demonstrating strong commitment to the China market and to the regulators, and others who influence the issuance of licences now and in the future, is very important to those who hold the keys to success; and those foreign firms attempting to be “fast followers” will face increased challenges. The ability to clearly articulate a well-thought-out, long-term China strategy is the key to attracting the best talent; however, then having the organisational fortitude to deliver on that promise in a complicated market is crucial to either retaining, or losing them. 2019 and 2020 will inevitably see more regulatory change and the firms that are forward thinking, adaptable and nimble will continue to be the ones who make the most progress. “Talent Retention” for established WFOEs is key in 2019. We have started to observe candidates moving WFOE to WFOE to trade upon their experience gained, and this is usually at a premium. Those firms arriving in the market a little later face a double-edged sword – there is a talent pool whom have 18 months WFOE experience; but they are harder and more expensive to shift. Clear articulation of the long-term China strategy of the group is even more important in 2019 than it has been before – there are simply not 50 tier-one GMs or Heads of Sales, and the best will be discerning. Many firms are exploring innovative ways to tie in senior staff long term via incentive programs. These could be linked to equity, shadow equity or profit share in the WFOE. This is a sticky topic and a difficult one to work out, but the goal is aligning senior staff to the success of the WFOE.